Chthonian planets are an interesting little concept. I’m not talking about the planet Vhoorl, either, despite any similarities to the name of a certain “Great Old One”. Instead, chthonian planets (a name coined by the authors of this paper) bear their name in reference to ancient greek gods who came from the hot infernal underground, and the origins of these worlds are no less hellish. Former gas giants which ventured too close to their star, these are planets whose atmosphere has actually boiled away! Roughly 10 years ago, the planet HD 209458b was discovered around a Sun-like star. Occasionally (and unofficially) named Osiris*, this planet shocked astronomers when they realised what they were seeing. Orbiting at about one eighth the radius of Mercury’s orbit (at 0.047 AU), Osiris has a year of just 3.5 Earth days. So close to the surface of a star, Osiris is slowly boiling. It’s heated so much that it’s significantly larger than Jupiter, despite having only two thirds the mass. The atmosphere of this planet is so hot that it’s slowly being blown away into space. It’s estimated, in fact, to be losing up to 50 thousand tonnes of atmosphere every second, meaning it may have already lost up to 7% of its original mass. This led to this proposal, in 2003 by Hébrard et al, of a whole new class of planets. The astronomers noticed that, of the hundred or so exoplanets known at the time, virtually none were found with orbital periods of less than 3 days. With the discovery of Osiris, they hypothesised that any planets closer than this might simply evaporate. 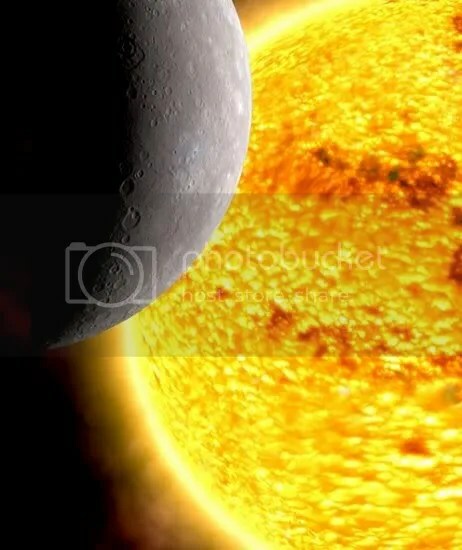 The atmospheres of hot jupiters are, as the name might imply, rather hot. The exact mechanism (like so much in astronomy) isn’t fully understood, although it’s believed, generally, that most atmospheric heating is caused by the ultraviolet and stellar wind put out by it’s parent star. Even Earth’s upper atmosphere (its “exosphere”) undergoes this kind of heating. From our comfortable surface temperature of between 200-300K, the upper atmosphere can reach 1000K! The other consideration is the tidal effect from the star itself. The effect is weak enough to be ignored in most cases, but so close to a star, a hot jupiter feels a lot of tidal force. This affects the density of the planet’s atmosphere, stretching and pulling on it. All of this combined allows you to calculate how quickly the atmosphere is being lost, using the Jeans’ Escape Estimate — the number of atoms and molecules with enough energy (and therefore speed) to escape the planet’s gravity. Above a certain altitude, molecules are lost from the planet for good**. Even a gas giant will lose against a star in a gravitational tug of war. What’s more, in 2003, these authors surmised that any planets with an orbit lasting less than three days wouldn’t be expected to survive very long. This helped to explain why so few planets had been found any closer to their stars at the time. These hot jupiters should change gradually over time, as their atmospheres are boiled away. Eventually, they’ll be left with only tiny amounts of their original hydrogen. Some may be left with no atmosphere at all, becoming chthonian planets. In more recent years, further work has been done on chthonian planets. Around a sun-like star, a gas giant like Jupiter would be evaporated down to it’s core with an orbit closer than 0.015 AU. Smaller ice giants like Neptune would be boiled away up to a slightly more distant 0.045 AU. Up until very recently, the hypothesis of chthonian planets was just that: a hypothesis. With the discovery of CoRoT-7b, however, it looks a lot like we may have found our first one! *Incidentally, a group of astrophysicists recently took a closer look at Osiris and determined that sunsets on this planet would be full of some rather lovely soft pastel colours. In rather stark contrast with everything else about the planet, which is frankly rather hellish! With thanks to davidnm for posting about that! **Actually, the technicalities of this make for quite a beautiful piece of astrochemistry. Molecules are considered to be definitively lost when their mean free path exceeds the distance to the boundary of the planet’s Roche lobe. In simpler terms, if a molecule doesn’t hit any other molecules (which might deflect it back) until it’s no longer inside the planet’s gravitational influence. Image: Composite, created (hurriedly) by yours truly. This entry was posted in Imported from Livejournal and tagged planets. Bookmark the permalink. 4 Responses to Ia! Ia! Chthonian Ftagn!